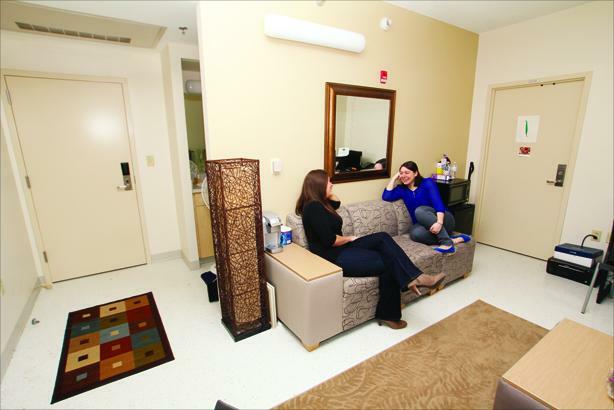 The residence halls at Husson University are your "home away from home." Our goal is to provide not only a safe and clean living environment but one in which you will become engaged in activities within your hall as well as interacting with other students. We believe this will facilitate your individual development and enhance your connection to the residential community as well as the University. The staff, working in conjunction with the students, strives to provide such opportunities. Please seek out your Resident Assistant to discover how many opportunities exist to become involved! While living in the residence halls, students will be exposed to lifestyles, beliefs, attitudes, and even values that may be different from your own. Each student will be challenged to be open-minded on these differences and use it as an opportunity not only to learn about others but also one's self. Whether you live in one of our three traditional residence halls, the Darling Learning Center, or the townhouses, Husson University's Residence Life staff is committed to providing you with a quality residential experience. On the main campus in Bangor, we offer housing in four residence halls - Hart Hall, Carlisle Hall, and Bell Hall, the Darling Learning Center, or the Townhouses. Hart, Carlisle, and Bell Hall are considered "traditional" residence halls that include rooms to accommodate primarily two residents, although some rooms may be triples. The Darling Learning Center (DLC), features suite-style living space for up to four residents per unit. The newest living option, the townhouses, offers 4 bedrooms and two baths per unit, as well as a full kitchen, living room and a washer and dryer. All of the residence halls are located in close proximity to the main academic building, Peabody Hall. Several dining options are available near the residence halls as well. A wide variety of meals are available 7 days a week at the Dickerman Dining Center, or for those that prefer to dine on a different schedule, the Eagle Grab and Go, Cressy's Marketplace or Willey's Cafe offers several dining options. For more information on dining at Husson University, follow this link. For full costs for all of our living options (as well as everything else at Husson), click through here. Please be sure to check out our "FAQ" page for more information about any common questions you might have about life on campus. Feel free to reach out for anything you might need! Our Office is open Monday-Friday from 8:00 am to 4:30 pm. Resident Directors are routinely in their offices from 9:00 am to 4:00 pm during regular business days. For any after-hour questions or concerns, please contact Campus Safety and Security at 207.941.7911 to assist you!